Paul Strassmann’s blog: 106. US and World Trade: Can New Tariffs Stop the Decline of the US in International Trade? 106. US and World Trade: Can New Tariffs Stop the Decline of the US in International Trade? Much of the economy of world depends the gains realized from world trade. The importance of world trade in stimulating the growth in GDP can be seen as the dominant influence in post-WWII economics. The crisis in US financial markets can be clearly assigned to the disruption of trends that favored a growth in international cooperation. The financial collapse had its origin from excessive US real estate debt that could be rescued only through an injection of funds from the US treasury. Though the entire world trade suffered from a precipitous GDP decline in 2007, the fiscal “stimulus” of funds (fiat debt from the US treasury) restored by 2010 the levels of world trade to pre-crisis levels of the world trade-to-GDP ratio. The negative consequences of an increased multi-trillion US debt became reflected in a decrease in the growth of world trade. Another way of interpreting the 2007 local US crisis is to see it as a world influence because of the dominance of the US world trade came to a halt. 2007 can be now seen as the start of a decline of the US as a world economic hegemony. The overall significance of the world trade in the world economy then declines from the levels never achieved before. By 2016 the trade-to-GDP ratio stood at 56.4%. That is the last data we have now available. 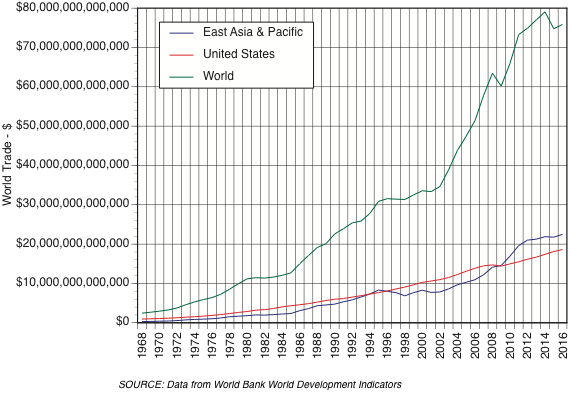 After the US financial recovery in 2009 East Asia and Pacific exceeded trading. The dollar levels of world trade levelled off after 2012 as Chinese economy started a re-alignment from emphasis on foreign export trade to diversion of the economy to increased domestic consumptions of goods and services. Though East Asia and the Pacific region now exceed the total dollar worth of world trade, the leading country China still lags behind the US in income per capita. With large relative wealth the US remains as the dominant world economy in terms of its overall financial resources. 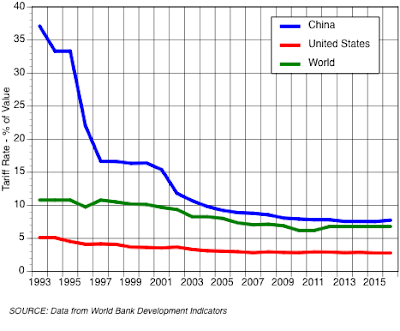 Despite the rise in world trade the entire world population and particularly China remain relatively poor. Therefore, the gap in per capita wealth between the benefits from trade between the US and the rest of the world will continue for years come. China dominated world trade as a % of its GDP until 2008. Afterwards it started leveling off from a 65% share of its economy to the current 37% share as gains in trade started accruing from all other countries. Meanwhile the US is keeping up its trade at about 30% of GNP but with a decreasing share of world trade as compared with conditions that prevailed from 1960 through 1980. Engaging in world trade still remains a large share of the US economy. It was the rise in US fiscal deficits that placed new tariffs on the agenda. Though the proposed 2018 tariffs are unprecedented and are counter to the globalization directions originated after the end of WWII, the actual cash that can be collected from such tariffs is negligible. The US national deficit cannot be restored or balanced by added revenue from tariffs. Even if we assume that foreign countries will not retaliate by rising their tariffs against US goods, it is not feasible for the US budget deficit to turn positive unless there is a totally unprecedented rise in US net trade which is unlikely. The exhibit below shows that until year 2000 the US trade was balanced. It is only after 1995 that the trade balance plunged into negative territory and remained there ever since. The zero or low US tariffs from 1950 through 1995 coincide with a steady rise in the US stock market prices as low tariffs encouraged trading with low cost nations. As the dominant importer of goods – China – is shifting from exporting to domestic consumption the US deficit remains while the Chines balance of trade has become positive. The above exhibit can be interpreted as a signal that the US dominance in trade has been broken and that China – with steadily lowering its tariffs – is now taking over world trade. There are many indications showing that former US dominance in world trade has been lost. This was first signaled when the steady expansion in dollar dominated world trade broke in 2007, never to recover again. Since the 2007 crisis was generated within the US by the collapse in excessive debt, the international credibility of the US leadership was diminished, never to be recovered to prior levels. The 2007 break can be therefore seen as an indication that the leadership in world trade would be changing. 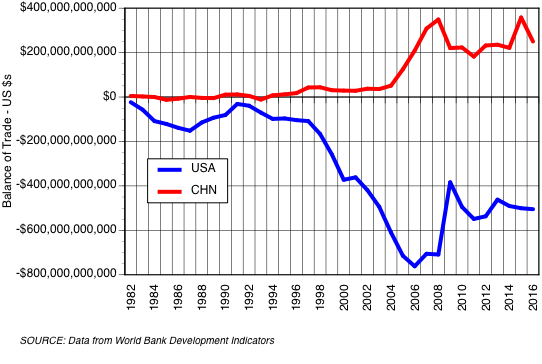 The second signal on the changes in world come can be found in the chart that shows that after 2009 China exceeded US in world trade and kept widening this gap. There is no evidence that at present the US has a new and large source of exports that could close the growing differences between US trade deficits and Chinese trade gains. A third signal about the shifting of the trade primacy from the US to China is the difference in tariff policies. The Chinese protect their high-value added industries in world markets. The US has not been able to stall Chinese investments in rental properties. The Chinese investments into long-term assets, such as infrastructures or natural resources are running counter to current US investments to generate short-term profits. With over 65% of the world population seeking betterment of their lives, it will be the world trade exports from the leading countries that will profit from gains to be made from a rise in the globalization of commerce. Current US economic policy is running counter to globalization. Therefore, new US tariffs will not only diminish our leadership in world trading but also diminish it.